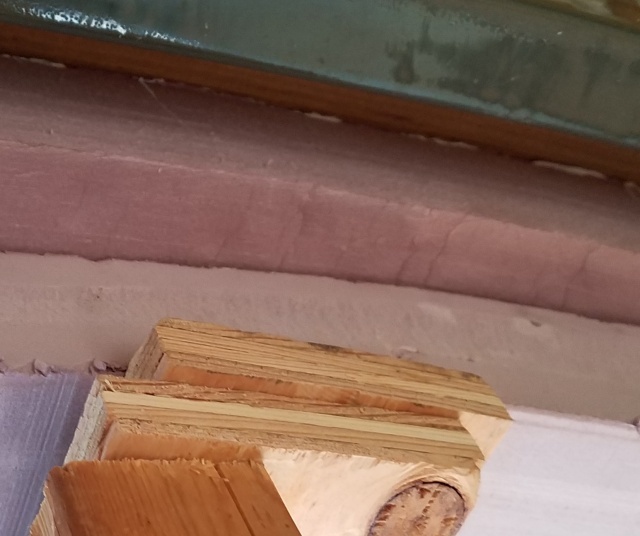 After I tried it with the insulation running sideways, I decided to try it with the insulation running long ways, which I could not get to work earlier. What I did was to put the piece of insulation against the roof, without bending it. That would be what the red arrow is pointing to. The blue arrow shows I added a second piece of insulation underneath the first one. 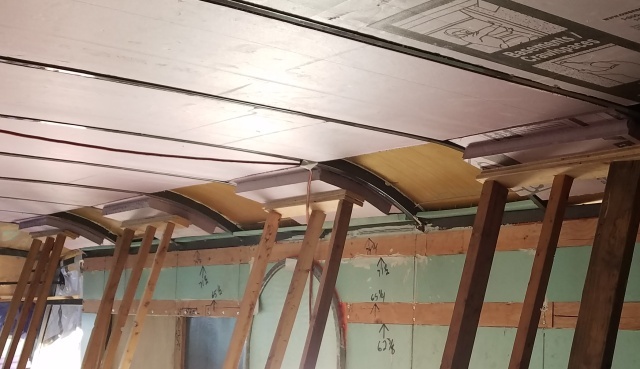 Below that, I took 2 pieces of plywood, (green circle), and held it in place, and then put a brace underneath that and slowly added pressure from side to side, until the top piece of insulation was fully seated. 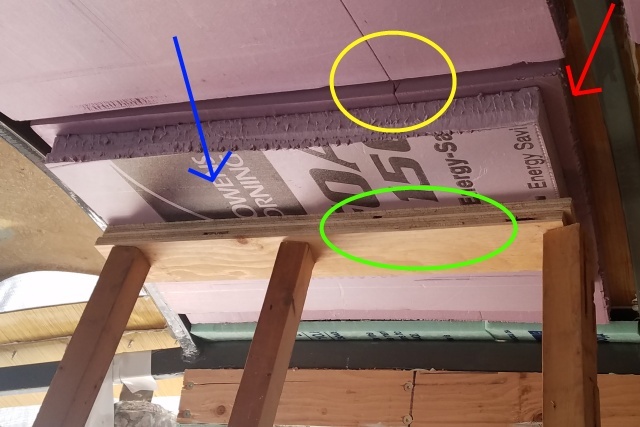 You can see inside the yellow circle that the piece of insulation I put up there has one of the score lines on it, running the same direction as the one in the center. That means the short piece is running the long way instead of sideways. Evidently, having that extra piece of insulation on the bottom, spreads out the force of the braces, enough, that it will bend and not snap. Here is a closer pic of the bottom of the piece of insulation that is against the ceiling. 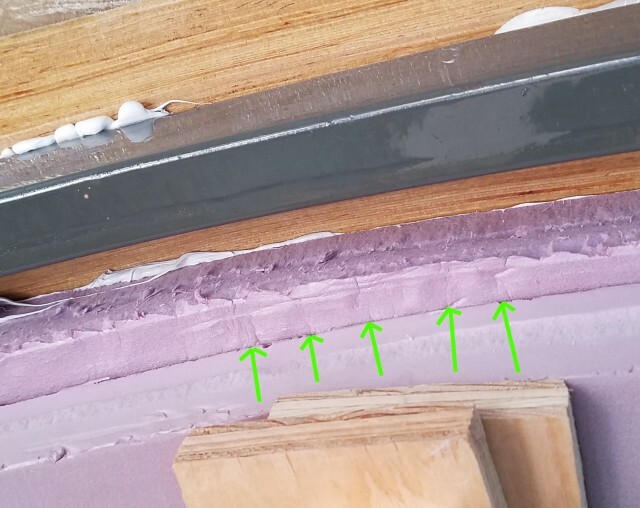 The green arrows show that the bottom side of the insulation has sort of wrinkled. Compression will do all kinds of funny things. This is a close up of the opposite side and it too is wrinkled just a little bit. You have to remember, this piece is running lengthwise, (which is the stiffer way), and not crosswise. Running the insulation sideways like I did on the rest of them, did not wrinkle the insulation like this. You can also see that the top piece of insulation is not split, or cracked, in either photo. Continuing this process, I filled in 5 of these "holes" on the passenger side. I will leave them sit for 2 days for the adhesive to cure. This pic shows the back half of the coach. This pic is of the front half, with some overlap. That means half of the right side now has insulation installed. Hopefully, in a couple of days, I'll get to finish the other 5 slots. That's where we stand at the moment. Yippee! Lol. Excellent! Looks like the insulation part is nearing its end. 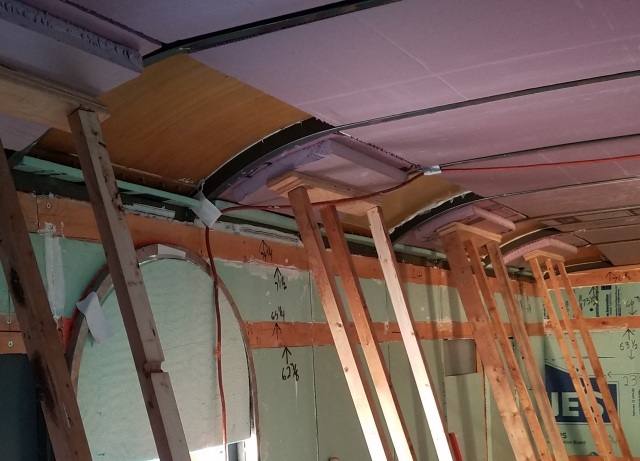 Now that most of your ceiling is done, was there consideration for a company that does spray foam insulation for your job? Those ceiling ribs would make good runners for screeding to level off after it cured. Glad to be getting near the end of the insulation. Thanks for the congrats. I don't check it all the time, but this thread is usually near the top of the (Popular) page. Has been for quite a while. Should be hitting the 4000 shortly. Glad to have you along for the ride, and again, Thank You. I never really gave it much consideration. I know spray foam is very quick, especially if having the pro's do it. Would have been done probably in a day, or two at the most. I wanted what I figured was the extra strength that I figured the foam board would provide. I had read of a couple people who used spray foam, and over time due to vibration and slight movement in an rv, that the foam started to fail. There may have been other conditions that also led to the failure, but I figured, the stronger the better, which is why I went with the foam board. Using the Chemlink M-1 for adhesive creates a very strong bond. I have a couple of pieces of foam "glued" with Chemlink and I cannot break the bond between the 2. That's exactly what I was looking for.